Two small CSA-type farms have come up with an idea that can make our transition to local food security something to count on year-round by growing storage crops and fresh winter crops. 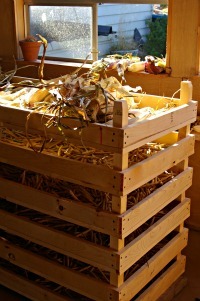 Though many CSAs concentrate on warm season crops for fresh-eating or preservation methods such as canning or freezing (and the more the merrier), the two farms reported here, Gaia Rising Farm (photos on this page of their farm) and Boulder Belt Eco-Farm, are both exploring the idea of providing winter storage and staple crops in a system based on the small-acreage community supported agriculture model. Gaia Rising Farm is located on Guemes Island, which is a short ferry ride from the Washington State town of Anacortes. While many visitors to Anacortes hop on the larger ferries to tour the San Juan Islands, the separate Anacortes -- Guemes ferryboat takes riders to an eco-friendly island with only one (very cool) general store. Gaia Rising is close to the ferry landing. Owner Sequoia Ferrel and her husband Lane Parks want to contribute to a low-carbon world by offering staple foods on a local, small-scale CSA basis. 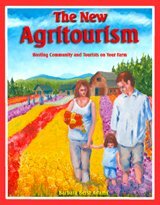 The staple foods they choose to offer “provide the bulk of our caloric intake throughout the year,” as they describe in their farm brochure. Gaia Rising operates as a non-profit research farm with the intention of serving the local community as a typical CSA. The farm resides in a “rain shadow” of the Pacific Northwest, meaning it gets less rainfall than nearby Seattle and far less than some of the not-so-distant temperate rainforests. The inches of precipitation are in the mid to upper 20s most years, and their trials and focus are mostly on foods that need only rainfall to thrive. Like many CSA owners, they want crop diversity as a form of food security, knowing that from season to season, certain crops will do better than others, and food will most likely be supplied regardless of a few succumbing to weather or disease. The Gaia Rising Farm CSA is new, and the owners plan to eventually invest in more processing and storage options. For their first year they offered a full share or half share, with the full share consisting of 50 pounds of potatoes, 25 pounds of onions, 25 pounds of corn either whole or ground, 30 pounds of beans, 50 pounds of squash, two pounds of flaxseeds, and five pounds of pumpkin seeds. The nature of most any small local farm involves ongoing research by default. The best seeds are saved, the most desired crops are replanted, and new tools are devised as human innovation builds on previous knowledge season after season. With Gaia Rising Farm, members who buy a share can especially sense their participation in the farm’s march towards year-round local food independence. 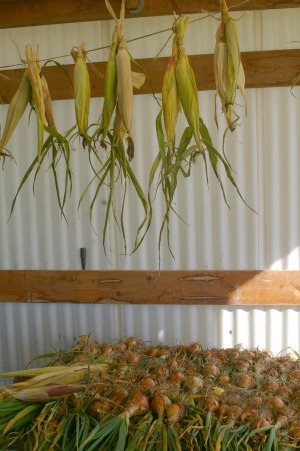 When people buy shares and become a member of the farm, they know they play an important role in determining the best future crop varieties, cooking methods and home storage techniques. The farm owners encourage feedback. Also, like many CSAs, members are encouraged to participate in harvest gatherings and fundraising events. Ferrel and Parks set up work parties for members to take part in various farm tasks including an autumn harvest gathering. 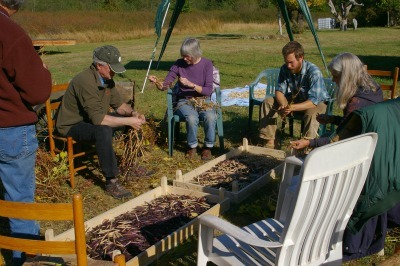 Members, for example, join together to participate in pulling bean pods from the stems, with the pods then being tossed onto Parks’ hand-made wooden drying racks. Future plans for the farm include continued crop trials for both increased productivity and to test varieties as possible staple food CSA options. For five years, the nine-plus acre Boulder Belt Eco-Farm in Eaton, Ohio has offered a winter CSA program as an option to their regular season farm share initiative. Owned by Eugene and Lucy Goodman, these farmers sell their products in various ways. Their markets include farmers’ markets, an on-farm store that uses the honor system including a change dispenser, and warm season and winter farm membership share programs May through January. The winter CSA officially starts near the beginning of November and finishes close to the end of January. A limited number of customers can pay an up front fee to purchase seven on-farm pick ups every other week. The Goodmans combine season-extension, winter gardening and crops for root cellar storage to provide winter shares for their customers. This means warm weather crops such as tomatoes, cucumbers and green beans are part of the shares in November. How do they do it? “Unheated movable hoop houses my husband Eugene designed,” said Lucy Goodman, “are used to extend the season of things like cantaloupes, strawberries (Albion and Seascape everbearing), Tomatoes (Sungold cherry and Glick's Pride), an heirloom red tomato, zucchini, cucumbers, and green beans. So eventually the Goodman’s warmer season crops give way to winter storage crops such as various winter squash varieties, onions, and garlic. As far as where they store their customers’ winter crops during the cold season, the Goodmans combine a variety of methods. “We do not have an actual root cellar,” said Lucy Goodman, “but rather store different things in different places. 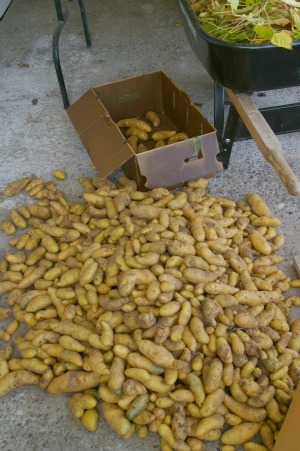 Potatoes are stored in two dead fridges. Besides extending warm weather crops, as mentioned, the Goodmans eventually use row covers and hoop houses for winter gardening. Winter shares, therefore, also include winter garden crops such as arugula, lettuce, spring mix, leeks, parsnips, carrots and kale. They explain that covers must be put on before the first frost. They make hoop houses with #9 gauge wire at eight foot lengths which are shaped into four-foot wide and two-foot tall hoops. The hoops keep the weight of the row covers and the material off the plants. As the owners point out, plants can get frost damage when they touch the row covers during the cold season. Year-round food independence with the CSA or farm share model will hopefully continue to become a satisfying local farming goal. “I love the fact I can educate and prove to people that it is quite possible to grow food in winter in the northern U.S. (Ohio in my case),” said Lucy Goodman.“And, that even without meat one can have a varied and healthy diet throughout winter with a combination of storage crops such as winter squash, potatoes, garlic, onions, carrots, etc. and fresh food that comes from unheated hoophouses.